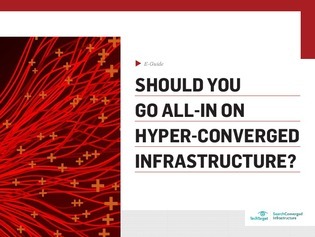 Should You Go All-In on Hyper-Converged Infrastructure? While HCI remains a popular architecture for VDI deployments, it’s also useful for organizations with use cases beyond desktops—including implementing a hyper-converged cloud for those wanting to make strides toward their hybrid cloud ambitions. Does this sound like your enterprise? In this expert guide, you’ll discover the role HCI plays in the hyper-converged cloud and how to use HCI to your benefit in hybrid cloud environments. Read on to also gain a snapshot of the history of hyper-converged infrastructure—including its evolution, benefits, and alternatives—and how it has evolved to take the place of RAID arrays. Trademarks: Dell trademark is of Dell Inc. or its subsidiaries.